Most homeless people lack decent footwear and regular foot care. To make matters worse, they tend to walk everywhere in all kinds of weather. In Hartford, CT, Footwear with Care (FwC) is changing this dynamic. Since 2016, FwC has been delivering durable and well-fitting walking shoes and boots as well as medical foot screenings to homeless children and adults in Hartford. To help homeless people secure and keep jobs, it also provides steel-toed boots, non-slip kitchen shoes, and dress footwear for work in construction, culinary services, and offices. FwC was started by Abby Sullivan Moore, a journalist and author, with the help of Deb Barrows at the nonprofit Community Partners in Action. She was inspired by Hartford Police Officer Jimmy Barrett. A veteran and advocate for the homeless, Officer Barrett bought new shoes for a homeless vet whose only footwear were worn-out flip-flops. 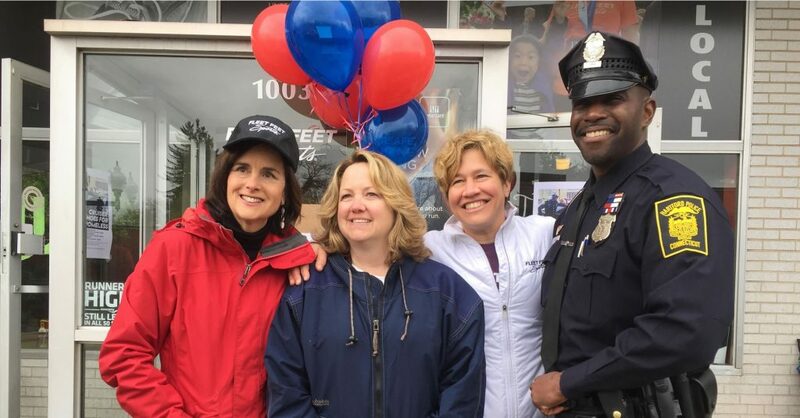 Abby reached out to Stephanie Blozy of FleetFeet Hartford (who immediately donated 40 pairs of shoes), the Connecticut Podiatric Medical Association and Hartford Police Department. Today FwC distributes shoes to people in need through large-scale footwear/foot exam clinics, Officer Barrett at Hartford City Hall, Hartford Community Court, pop-up boot clinics and outreach to homeless living outdoors; it also responds to referrals from schools, shelters, police, and others helping the homeless. To donate via the CPMA Foundation, click here.